Three blasts struck the northeastern Nigerian city of Maiduguri, a military spokesman said on Sunday, a day after a new audio message purportedly from Boko Haram leader Abubakar Shekau accused the army of lying about successes against the militants. A hospital source, speaking on condition of anonymity, said at least eight dead bodies had been recovered after the blasts in a mosque and areas near the building on the edge of the city center, with many more feared dead and around 50 people injured. There was no immediate claim of responsibility for the explosions. However, they bore the hallmarks of the Islamist militant group which has waged a six-year insurgency to form a state adhering to strict Islamic laws, a conflict that has killed thousands. The audio recording, said to be of Boko Haram's leader, criticized Nigeria's military for saying it had recaptured villages that had fallen into the group's hands. "They have lied about us saying that they have retaken our territories, taken weapons and driven us away," says the recording posted online on Saturday. "They are actually the ones whom we have driven away. They are all liars." "There were three improvised explosive devices explosions at Gomari and Ajilari general area in Maiduguri at about 7:21 p.m. (3:21 p.m. EDT)," said military spokesman Colonel Sani Usman. "Although details are not clear, it is important to note the attacks signify high level of desperation on the part of the Boko Haram terrorists," he said. 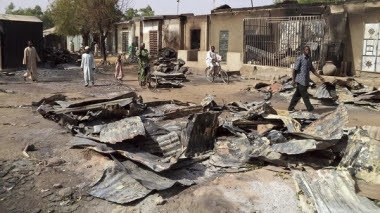 Suspected members of the group have killed around 800 people in Africa's most populous nation in a spate of bombings and shootings since President Muhammadu Buhari was inaugurated as president on May 29, vowing to crush the militants. At the start of 2015 Boko Haram controlled vast swathes of territory across three states in the northeast. Nigeria's army, aided by troops from Chad, Niger and Cameroon, said it pushed Boko Haram out of most of that land earlier this year. Since then, the group has carried out its attacks on public areas such as mosques and markets. When asked about the audio recording purportedly of the sect's leader, Colonel Usman said it was "the rant of a drowning man" before adding that experts were trying to establish whether it is Shekau's voice. Reuters could not independently verify the authenticity of the audio message. Nigeria's military has repeatedly claimed that Shekau has been killed over the last few years only for him to resurface in new videos and recordings, although security sources have said he may have been replaced by impostors. Last month Chad's President Idriss Deby said Shekau, who has not appeared in a video since February, was wounded and had been replaced as leader by Mahamoud Daoud, of whom little is known.